Olly and Gale are also making new music and hope to have a fifth studio album out in 2010. For now, however, Bottled At Source – The Best Of The Source Years draws a fitting line under the first phase of a constantly surprising career. With a bonus disc of rarities and demos, plus four unreleased songs from the Dark On Fire sessions, the collection offers something new for dedicated fans and a tempting resume of Turin Brakes’ first ten years for any newcomers. Turin Brakes have never been a particularly easy band to pin down. We might know them as two unassuming lads from South London who strum acoustic guitars, sing spine-tingling harmonies and write brilliant, bittersweet love songs. Beyond that, though, many of us don’t really know who they are. That could be about to change with the release of the duo’s first career-spanning album, Bottled At Source – The Best Of The Source Years. Of Turin Brakes. Beginning with The Door, the lead track from their 1999 debut EP, it follows Olly Knights and Gale Paridjanian through the high points of four contrasting studio albums, culminating in 2007’s Dark On Fire. In doing so, it finally makes full and proper sense of a group who have constantly confounded fans by steadfastly refusing to make the same kind of record twice. ‘We seem to confuse a lot of people, because we’re not straightforward,’ says lead singer and rhythm guitarist Olly. ‘But that’s why people like us, too. We have been difficult to market. It’s much easier to sell vanilla ice cream than something with lots of interesting, nutty bits. Olly met harmony singer and lead guitarist Gale when the two were still in primary school in Balham, South London. The pair spent much of their childhood in and out of each other’s houses and made their first public appearance together at a school concert in 1985. 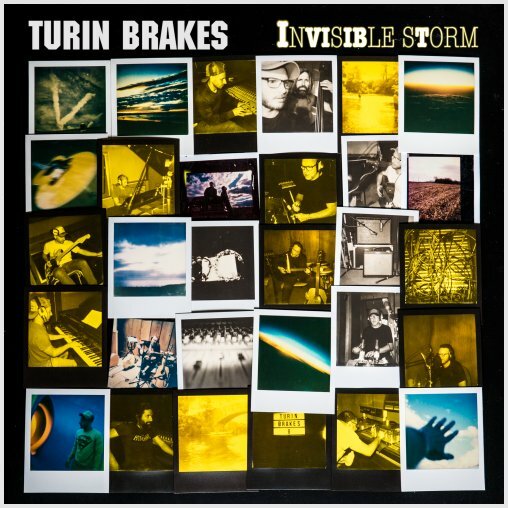 Turin Brakes grew, almost by accident, out of the songs they wrote together in their late teens. They chose their name before releasing that debut EP, ‘because we didn’t want to call ourselves Olly And Gale’. The signature sound of their early years – shimmering acoustic guitars, vocal harmonies as soft and refreshing as a gentle summer breeze – was captured perfectly on their 2001 debut album, The Optimist LP. Featuring songs such as Underdog (Save Me) and Emergency 72, it was nominated for that year’s Mercury Music Prize. Despite its pristine, acoustic feel, it also won admiring glances from fans of chilled-out British dance acts like Zero 7 and Lemon Jelly. Typically, the second Turin Brakes album was a radical departure. Recorded in a Los Angeles studio with American producer Tony Hoffer (Beck, Air, The Kooks), Ether Song found Olly and Gale shunning the folkier instrumentation of The Optimist and embracing a sun-kissed, electrified, Californian feel on songs such as Long Distance and Top Five hit Pain Killer. With a hit album and single, Turin Brakes were suddenly in demand. They toured with a full band, sold out two nights at Brixton Academy, supported David Gray in America, gigged with Coldplay in Italy and, in 2004, found themselves part of the Band Aid 20 cast for the revamped Noughties take on Do They Know It’s Christmas, alongside Paul McCartney, Radiohead and Robbie Williams. Continuing their tradition of making records that were a direct reaction to the previous album, Turin Brakes re-engaged with their old selves on 2005’s Jackinabox. Made in their own studio, their third album took the duo back to basics without being quite as stripped-down as The Optimist. The album’s first single, Fishing For A Dream, told a tale of celebrity parties and the red-carpet life, while the record as a whole was driven by the realisation that home, after all, is where the heart is. Another change of tack followed with 2007’s Dark On Fire, a raw, electrified album produced by Ethan Johns, a man whom Olly and Gale had long admired for his work with Ray LaMontagne and Kings Of Leon. Recorded at Olympic Studios in London, the record hit home with a meaty swagger and what Johns himself termed ‘some extraordinarily truthful performances’. The album’s first single, Stalker, with its clanging guitars and sinister lyrics, set an eerie, slow-burning tone. ‘We wanted to work with Ethan partly because of the soulful string arrangements he did for Ray LaMontagne,’ says Olly. ‘But, when we got to the studio, he said that he was going through a change of style and didn’t want any strings on the record. He wanted a raw sound instead. ‘Ethan was really firm about keeping the live essence of our performances and we went along with that because we didn’t want to tie his hands. He didn’t want to do any overdubs, and he fought us tooth and nail to keep things live. Since Dark On Fire, Olly and Gale have been highly sought-after as songwriters. They have worked with Dido and emerging Anglo-Australian singer Lisa Mitchell. They also supplied a track, Here, for Take That’s chart-topping The Circus, and jokingly claim that, following their efforts on Band Aid 20, they have now had a UK Christmas number one in both the singles and albums charts.